Last month, veteran Congress leader and ex-CM of Mizoram Lal Thanhawla and his wife participated in a protest against the Citizenship (Amendment) Bill 2016. 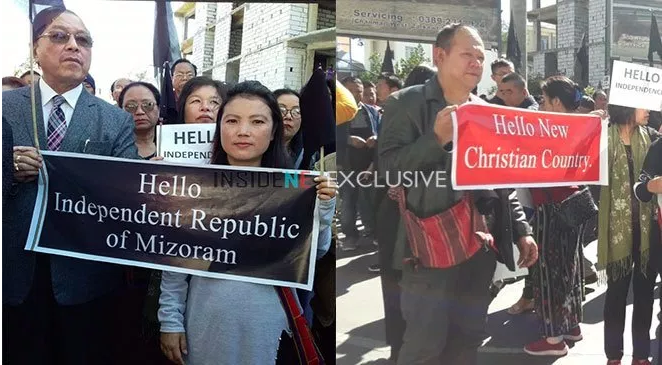 The five-time Mizoram Chief Minister was seen holding a black flag symbolizing protest along with a banner that reads ‘Hello Independent Republic of Mizoram’. Other protesters had banners reading ‘Hello New Christian Country’. The anti-Hindu nature of this protest was clear from banners which read ‘No Hindu relics at Vangchhia, ASI lies’. The reference was to the 2017 discovery by Archaeological Survey of India (ASI) of sculptures of Hindu Gods Ganesha, Kalki and Makara guarded by Neolithic menhirs at Vangchhia, Champai district of Mizoram. In 2016, the Modi Government introduced the Citizenship Amendment Bill which was finally passed in Lok Sabha on Jan 8 this year, but could not be tabled in Rajya Sabha due to vociferous opposition by the Congress-led ‘secular’ lobby. This bill provides for according Indian citizenship to Hindus, Jains, Christians, Sikhs, Buddhists and Parsis from Bangladesh, Pakistan and Afghanistan after seven years of residence in India instead of 12 years, which is the norm currently, even if they do not possess any document. Since the bill could not be tabled in Rajya Sabha, it is set to lapse on June 3 when the term of the present Lok Sabha ends. Many parts of the North East (NE) are up in arms agains the Bill, which is being smeared as an attempt to dilute the identity of native inhabitants of NE states. Almost all Christian groups are claiming the bill is a ploy to secure a ‘Hindu votebank’ in the Northeast, and to reduce non-Hindus to a minority in their lands. Such is the hatred towards the Hindu ‘pagans’, that the brutal persecution of all minorities (including even Christians) in countries like Pakistan, Bangladesh has been forgotten by these extremist Christian groups. Even something as incontrovertible and non-controversial as an archaeological discovery becomes grist for the propaganda mill of these brainwashed protestors, while they themselves brazenly concoct stories about ‘St. Thomas having been killed in Bharat by Brahmins’. Now, who will tell these radicalized Christian Mizo youth that the China which they dream of joining is a country that is cracking down on Christianity like none other, where even an open display of the Christian cross is not allowed by the brutal Communist dictatorship. That, ironically, their own country which they hate is the one with the most religious tolerance and acceptance of different belief systems in arguably the whole of Asia – all because the majority population here is Hindu. However, such blatant anti-Hindu sentiment is par for the North East, where Christianity has spread like wildfire only in the last one century. For eg., the share of Christians in the population of Mizoram shot up from 3% in 1911 to 90% by 1951. As per 2011 census, Christians are a clear majority in 3 out of 7 North Eastern states – Mizoram (87%), Meghalaya (75%), Nagaland (88%) and a dominant force in Arunachal at 30% (where Hindus are 29%, tribal religions 26%) and Manipur at 41% (Hindus too are 41% there). Yet, almost all these states have refused to give minority rights to Hindus and tribal religions or even set up Minority Commissions. Much of the tribal populations of the 7 North Eastern States today is Christian – this mass conversion & irreplaceable, permanent loss of such rich cultural & religious diversity has gotten zero attention from Bharat’s left-liberal intelligentsia, who shout themselves hoarse over Ghar Wapsi (return to indigenous beliefs) of even 1 person. Another defining feature of the North East is the political dominance of the Congress party, until recently. Naturally, the Church and Congress share a symbiotic relationship and both are upset at the entry of BJP-NDA in this region. The dominant Christian Church in each state is open about its political affiliation. The Mizoram Presbyterian Church took an anti-BJP stand urging its congregation to abstain from voting for the BJP in the recent Assembly elections. Before Nagaland state elections the Baptist Church spewed anti-Hindu rhetoric while exhorting voters to choose “Christian Principles over Development”. Radical Christian-Maoist terror groups issue ultimatums to Hindus of Assam and Tripura to flee or be killed, and no one in Lutyens’ media even bats any eyelid. Even today, while this treasonous action of demanding an ‘Independent Republic of Mizoram’ by a Constitutional post holder like ex-CM Lal Thanhawla was reported by outlets like India Today and Scroll, they completely censored the fact that this was a religiously-motivated protest where participants were calling for a ‘New Christian Country’. Will anyone from our self-proclaimed ‘fearless, independent-spirited’ Lutyens’ media cabal question the janeudhari Rahul Gandhi to explain this treasonous, bigoted action of his party leadership?